April 8, 9 & 10, 1965. CO’F. wrote: “I have produced this play because I am attracted by its truth. It frightens with its truth and reality. 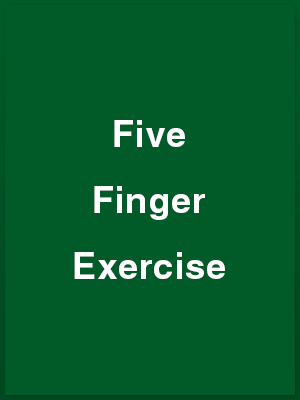 Five Finger Exercise is about people we know. People we should try to understand. Technically it is a very finely made piece of theatre, offering superb acting opportunities for those playing it and achieving exactly what the title suggests. It creates an exercise for five fingers or characters, each complete in itself but each using the others to perform the finished exercise. FOR their fourth and last production of the 1964 – 1965 season the Wick Theatre Company has chosen Peter Shaffer’s play Five Finger Exercise, which enjoyed a critical and popular success in the West end in 1958. Mr Shaffer is also the author of The Royal Hunt of the Sun, and of the double bill, The Private Ear and The Public Eye. Auditions having been completed and the five parts filled, rehearsals have just begun. The director is Clodagh O’Farrell, who scored an acting success in the title rôle of Anna Christie, the company’s first production of the season, last September. The play concerns an affluent family of four – father, mother and teenage son nd daughter – and the German tutor who comes to stay with them. The five players are Betty Elliott, producer of The Murder of Maria Marten, which reached the Sussex Drama Festival final in November, as Louise Harrington; John Perrett, who played the wicked Squire Corder in Maria, as her husband Stanley; Ray Hopper as Clive Harrington; and Isabel Pilcher as Pamela Harrington, who also played brother and sister – Tim and Meg Bobbin – in Maria; and Robert del Quiaro, who played opposite Miss O’Farrell as the Irish stoker Matt Burke in Anna Christie, as Walter Langer. Five Finger Exercise will be staged at the Barn Theatre, Southwick Community Centre, on April 8, 9 and 10. ONCE again, at the Barn Theatre, Southwick, last weekend, the Wick Theatre Company demonstrated that they can be relied upon to present a worthwhile play, worthily acted. Clodagh O’Farrell’s fine production of “Five Finger Exercise,” by Peter Schaffer, was a revelation of the sheer acting ability in but five members of the company’s pool of acting talent. Each made a decisive contribution to the overall success that this play turned out to be, as grand a piece of team work the Barn has seen for a long time. Enhanced by John Perrett’s splendid set – a Suffolk weekend cottage – the play revealed the fierce undercurrents of tension between the Harrington family of strangely ill-suited parents, son and teenage daughter. Stanley, the father, a self-made furniture manufacture, could not understand his brilliant but unhappy son, Clive, up at Cambridge. Louise, the mother, an artistic and attractive woman, was at mental loggerheads with her husband and her championing of Clive deepened the rift between them. Pamela, the tomboy school-girl, was less of a problem, but a bit of one, all the same. Her tutor, Walter Langer, a studious, lonely young German haunted by an unhappy past, shared the life of the strangely ill-assorted family, deeply concerning himself with their personal problems and becoming tragically involved. Betty Elliott and John Perrett cast as Louise and Stanley, brought a wealth of understanding to their taxing rôles and invested them with the requisite degree of utter contrast. The quality of their acting, sustained throughout, was such that it smacked of reality even in the most testing moments. Ray Hopper’s portrayal of Clive was masterly, embracing a wide range of human emotions, each expressed with consummate conviction. Equally notable was Robert del Quiaro’s performance as Walter, a key rôle quietly but compellingly invested with the stamp of truth. And a bouquet for 14-year-old Isabel Pilcher, admirably qualified to play the 14-year-old Pamela. She caught the very essence of the part. The Wick, it seems, “catch ’em young” these days. Backstage helpers who all assisted appreciably were Frances Thorne, Frank Hurrell, Morfydd Bowen, Margaret Perrett, Pauline Dorman, Terry Mase and Jean Porter. PETER SHAFFER’S play, “Five Finger Exercise,” which the Wick Theatre Company presented at the Barn Theatre, Southwick, last weekend has a peculiar difficulty. It is a play of shades of meaning, a slight over-emphasis here or a slight under-emphasis there can upset the very delicate balance. The Wick Theatre Company preserved this equilibrium most, but not all, of the time. Into the strange household of Stanley Harrington, a self-made man; Louise Harrington, snob and poseur; Clive Harrington, mixed up and groping; and healthily normal Pamela Harrington, comes the talented and rather beaten Walter Lange. His presence in the household brings out the worst in all but Pamela. Betty Elliott was the completely artificial Louise, despising her earthy husband in everything but his money. She gave everything to this character except an underlying streak of sheer nastiness. John Perrett did extremely well as her husband, Stanley, tortured by his own inability to understand his son, never knowing what to believe. Ray Hopper also did well as the son, Clive, but, here again, that nuance of meaning in his character was minutely under-played and the same is true of Robert del Quiaro as the German tutor, Walter Langer, a refugee from Nazi parents. Both of these characters were well played, make no mistake about that, but there are really difficult. Isobel Pilcher romped merrily through the part of the 15-year-old Pamela and did not put a foot wrong. John Perrett has designed a workable composite setting; the lighting and effects were good. This production so nearly missed the peak that it is almost possible to give them credit for having planted the flag.